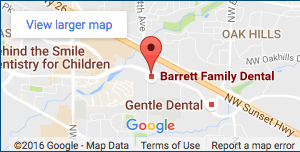 As your trusted Beaverton family dental care provider, Dr. Barrett wants every patient to know that the best practices for protecting the long-term health of your teeth and gums require brushing and flossing daily, along with scheduling regular appointments at our Beaverton family dental care office once every six months. Not only can these practices help to prevent the development of dental decay and disease, they also play an important role in protecting your overall health as well. The next time you decide to skip brushing or that you don’t have enough time to floss, consider the five frightening things that can occur when you fail to make your oral health a top priority. Many people already have a hard time successfully navigating the stress they deal with daily, and those less capable of not sweating the small stuff may have a higher risk of developing cavities when compared to those experience less stress. Whether high stressed individuals simply consider good oral hygiene less important or that poor brushing and flossing habits contributes to increased oral inflammation and increases psychological unrest isn’t entirely understood by experts. Whichever comes first, considering the care of your teeth a way of managing stress during a hectic workday. If nothing else, fresher breath may help ease a little of your worries. Going one or two days of failing to brush won’t cause you to develop this deadly disease, but suffering from dry mouth and high levels of oral bacteria can exacerbate preexisting conditions like diabetes. If you’re at a higher risk of diabetes, you may want to consider keeping some floss and sugar-free gum at your desk or in the car to remove any bacteria or food particles that linger in your mouth after eating. Individuals who suffer from diabetes have a hard time preventing infection – like gum disease – and those with an infection have a hard time regulating their blood sugar levels. This gives diabetes a very symbiotic relationship with the development of gum disease. You can help improve your cognitive function when you get older by preventing gum disease today. Studies have found links between gum disease and an increased risk of dementia. While researchers still don’t know the exact nature of this connection, evidence does suggest that gum disease caused by poor oral hygiene increases the risk of Alzheimer’s and other cognitive issues later in life. A healthy teeth and tongue can also lead to stronger bones in your mouth. A buildup of bacteria between your cheeks can destroy the connective tissues that hold your teeth into position, while also weakening your immune system, according to the National Institutes of Health. Bone loss – also known as osteoporosis – that becomes more of a risk during old age or other health related issues has also been linked to poor oral health. A build-up of oral bacteria can also create perfect conditions for the growth of pathogens that have been linked to arterial plaque. Increased levels of arterial plaque increase your risk of stroke and heart attack. Brushing daily helps to significantly lower your risk of heart disease.